This paper has an acid free base, PH Buffered, 100% cotton rag on 330 gsm weight. 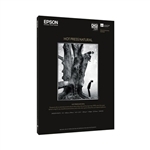 It has a white surface, without OBA’s and an ultra smooth finish for excellent colour and black & white reproduction. With extreme high D-Max for high contrast, it dries instantly and has a wide colour gamut.